I would only recommend 3d printing to someone who wanted a hobby, and wanted that hobby to be 3d printing, not "having parts made on a 3d printer". The printing itself is the activity. If you have any other primary motivation your parts will fail more often than they'll succeed. 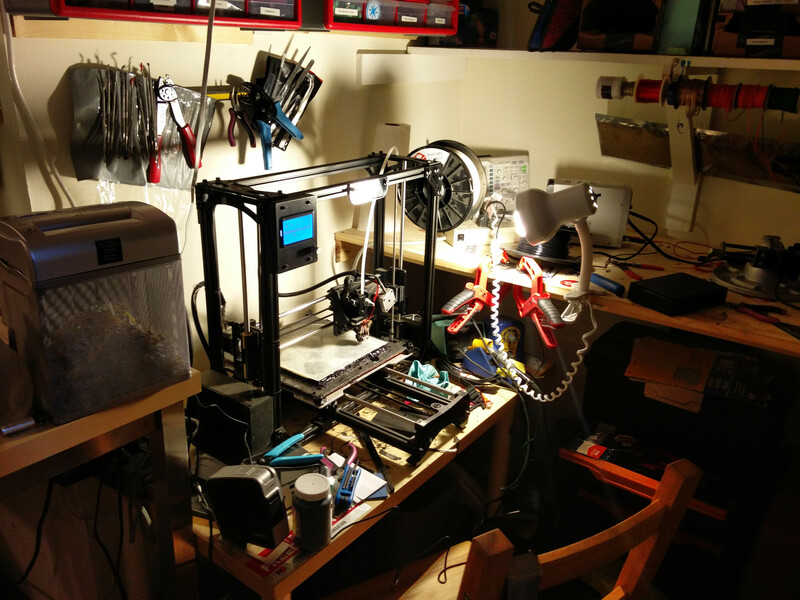 3d printing with open source tools is this weird siren's song for me. I'm an open source enthusiast and apologist. I'm an early adopter. I'm a born tinkerer. I'm a wishful inventor. I'm a programmer and electronics nerd. 3d printing theoretically ticks all the right boxes. I've been joking on twitter lately about taking a laise-faire approach to my prints. Well, that just doesn't work. I can either joke about it, and still take the care, time, and attention required to get good parts, or I can behave that way, and make lots of substandard or broken pieces. When I got my TAZ 2 in 2013 it was really the only power tool I had, or could have besides a household drill. Apartment buildings are not really conducive to the workshop lifestyle. I spent about two thousand dollars on it. I decided on a more known brand, with good reviews about service and support. It had an enormous print area (which I'll later tell you why that is silly) and a brand new version had just come out. There are many other reasons I'd recommend them, but if I had it all to do over again, I'd probably buy the cheapest printer I could stand. Something like what printrbot is making. At Lulzbot, they know what they're doing. They send you a bag with all the tools you need. They send you a big printed book of what to do when things go wrong, they assemble the whole thing and test it once. They provide you with config files for the vast array of programs you need to get the thing going, and test it on windows, mac and linux. After your upfront cost, there's filament cost, which is honestly pretty negligible. There is free software that will do everything you could possibly imagine, in a way that you can't possibly get your head around. I studied Electrical Engineering, I took several 2d and 3d CAD classes, and I work building software. I've built complex precise printed machines out of parts designed in OpenSCAD, which is a 3d modeling tool where the primary interface is a text editor. It looks suspiciously like programming. It is infuriating to use. I know how good modern commercial parametric CAD programs are, but I can't really justify the ($2k-$3k/yr) cost to use them. Operations like bevels and chamfers that are crucial to good prints and parts are nowhere near as simple in OpenSCAD as they are in Inventor or Solidworks. In OpenSCAD I'm constantly doing mental gymnastics and lots of pencil and paper geometry to translate axises of the various solids, additions and subtractions involved. Rather than put holes in things, you put a cube, then you put a cylinder then you subtract the cylinder from the cube. In Solidworks, it's a hole. 3d Printing is near instant, if you compare it to sending parts to a machinist you've never met in a country that you can't spell. If you compare it to sawing or working a block of wood for a simple part, it's near infinite. Sketches need translated into code, which needs translated into an object file, which needs translated into gcode, which needs sent to the printer one at a time. The bed needs checked and prepared for every print, and then the print gets started. The first print I typically rough-in (5% infill, thick layers) to verify that things are going well, and then I'll make another with better settings. 10 to 40 minutes for simple things the size of a small stack of quarters, or about a tablespoon of material. 4 to 6 hours for complex things the size of your fist. I've literally never had success with prints more than the size of two fists, but I've let things almost succeed for upwards of 20 hours. Verify that the radius settings are appropriate for my print, too few polygons and you'll get hexagons instead of circles. Export to the format that slic3r uses. Open Slic3r, which prepares the machine instructions. Configure Slic3r for my print and my printer. Where on the printer should this be placed? Are there bridges or overhanging bits of my part that need supported? How much solid at the bottom, top and sides? Verify that you're using hexagon infil and not rectilinear or something worse. Open up my printer controller. Test that both the bed and the extruder are heating properly. Wait for the bed and extruder to heat up. Put a layer of "ABS Glue" (old broken parts and acetone) on the bed so that things stick. Test extrusion to make sure that it's not clogged. Load the machine code into the controller. 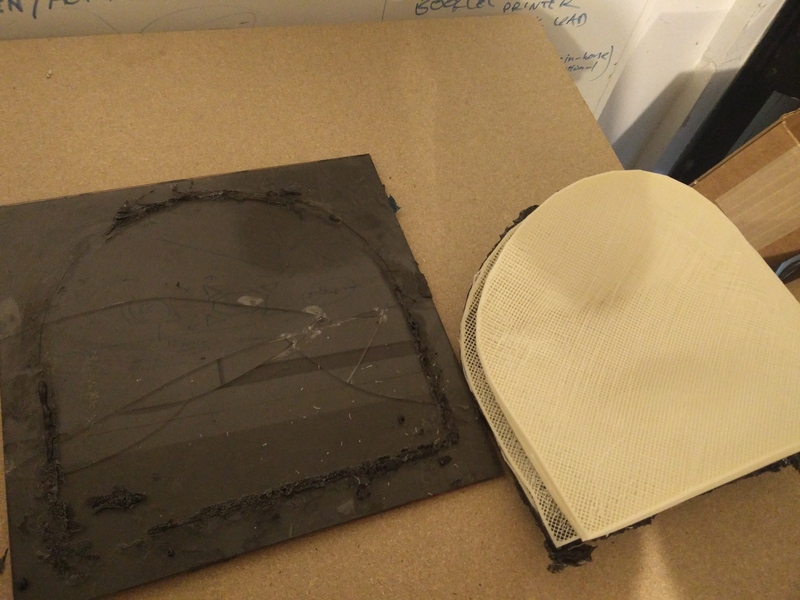 Verify that the skirt (extra bit around the outside) is in the right place, and that the first 2-4 layers print well, and are stuck to the bed. If the print finishes successfully, wait for the bed to cool. Pry the print off the bed. I've literally had each of these steps fail in one way or another. It's an enormous amount to process. This week I attempted to print a part that is roughly 10 x 10 x 6 inches. It's huge. It's tiny, but it's huge for 3d printing. I had almost all of these problems. I had to go do my job, so I setup a complicated webcam and remote desktop setup. It failed in numerous ways over the course of the day. That's just the ends of it. More parts fail than succeed, even with all that prep. Sometimes they fail because they wern't properly designed. Sometimes they fail because I missed a step. Sometimes they fail because fortune favored something else that day. Sometimes they fail because the inherent structural weaknesses of layered additive manufacturing don't happen to coalesce with arranging the part on the bed so that it creates a stable print surface. You have to be able to accept this failure as part of the process. My most recent failure resulted in a shattered bed. I've got glass everywhere, and besides that the glass is glued to the heating element, It seems likely I'll have to replace both, probably for upwards of two hundred bucks. Overall, 3d printing is fun, and it's incredible when it works, but I'm losing interest in the process and the product is substandard compared to most other methods of manufacture. I'm interested in 3d printing as part of another process, but as my primary process, I'm probably finished. 3d printing is for the sort of person who hears me say "It's not for you" and does it anyway. It takes that sort of determination and defiantness to succeed at it. I put up a gallery on Dropbox of some prints over the last couple years. These vary from electronics enclosures, to robot parts, to parts made from 3d scans of sculptures and people. There are also some fairly frivolous things in there.